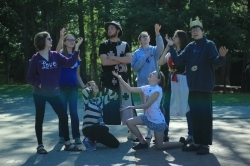 Living and breathing Deutsch (German) is what Waldsee is all about. But sometimes, after a few summers at Waldsee, Villagers may want to do something new. That’s what our Abenteuerprogramme (adventure programs) for two week Villagers are all about! Today, we take a look at the Märchenwald, our medieval theatre adventure program. Peter and LKT Gruene Welle on their week-long camping trip. ​Waldsee’s former villagers go on to do exciting things with their Deutsch. Peter, a two-year villager and ten-year staff member, tells us how Waldsee and the Grüne Welle program have led him to a career working for the environment.